Do you get liquid based scents on all over your hands and fingers when deploying them? Do you have to put down your bow to deploy your scents? Do you struggle with other urine based scents because they dry out too quickly? Do you fumble with the scent bottle and drop the cap while trying to be quiet at the same time? EverScent Gel starts out as small hard crystals that look like a lot like course/sea salt. We add exactly the right amount of real liquid based natural animal and/or food based scent to the crystals. Our precise and proven process ensures that the scent and liquid are absorbed into the crystals until they are at maximum capacity without leaving behind a soupy mess. EverScent Gel evaporation is much slower than other scent dispensers like wicks and cotton due to the physical make up and technology of the crystals. 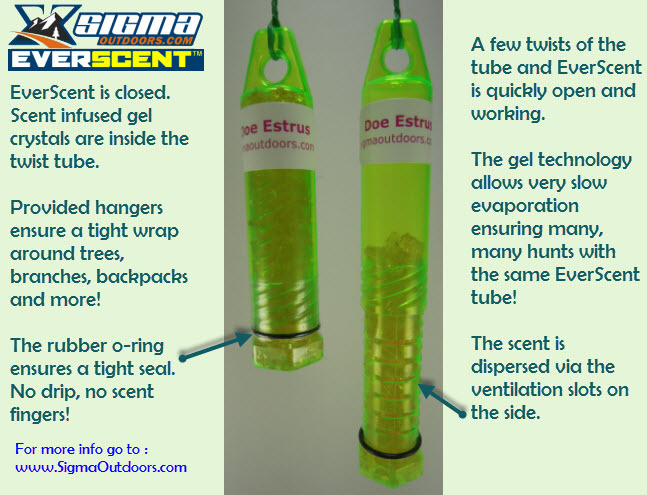 The great result for hunters is a long-lasting, slowly released and full-strength scent in a no mess, easy to deploy twist tube. It doesn't drip, it doesn't spill, it doesn't get all over your hands and pockets. When you're done, twist it closed. The rubber O-ring at the bottom helps ensure a good seal and prevents evaporation when not in use. To use EverScent, just make a few twists and hang in your favorite spot. Best of all lasts a long time and it works. We have the videos to prove it. EverScent Choice is a great no-mess alternative for those who have a loyalty to their own brand of scent. 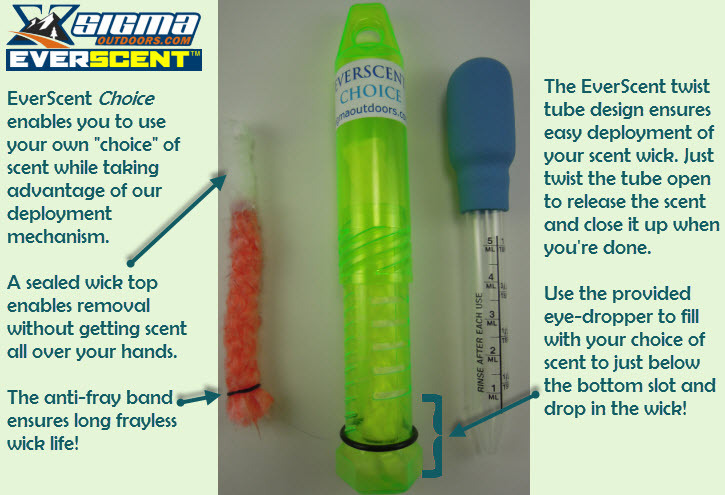 Utilizing the design of the EverScent Gel tube, we took a single vent slot out of the bottom of the tube and gave you a quality 5ml eye-dropper to deploy your scent of "choice." Inside the tube is a super fast absorbing fiberglass wick, with a sealed top and a anti-fray band on the bottom. This sealed top allow full absorption of scent into the wick, but allows you to remove it without getting scent all over your hands. The anti-fray band allows you to re-use the wick time and time again without destroying and fraying the wick end. Simply remove the wick, place a dropper full of your choice of scent into the twist tube, re-insert the wick, wait 20 seconds or so for liquid to absorb, twist the top back on and close. The rubber O-ring at the bottom helps ensure a good seal and prevents evaporation when not in use. To use EverScent Choice, just make a few twists and hang in your favorite spot.